The Master Cleanse, also known as the Lemonade Diet, was created by Stanley Burroughs as a diet plan to aid in quick weight loss. Proponents believe cleanses, or detox diets, rid the body of accumulated toxins and waste products that lead to weight gain, lethargy, digestive upsets and generally poor health. MayoClinic.com notes detox diets are not scientifically valid and could lead to further health problems. Although the diet plan will aid in weight-loss, it is typically water weight lost initially from calorie and nutrient restrictions. Consult with a physician before starting a cleanse to determine healthy meal plans. The Master Cleanse consists of an ease-in period followed by The Lemonade Diet, then an ease-out phase. The Master Cleanse website says the ease-in phase is not as significant as the ease-out period in which dieters come off the diet. The Lemonade Diet typically lasts 10 to 14 days. During this period, dieters drink only a specific lemonade. The ease-out period that follows this liquid phase re-introduces solid foods into the diet, with a focus on healthy eating habits. The ease-out phase of the Master Cleanse may enhance weight loss and improve health or hinder both these areas. Eating too many foods too soon or the wrong types of foods can lead to nausea and digestive upsets, such as bloating, constipation and cramps. Returning to high-calorie, fatty and processed foods will cause any weight lost to be regained and possibly more. Always consult a physician or health professional to determine what may be safe for you or if you experience adverse health symptoms. The first two days after a cleanse should primarily consist of drinking fruit and vegetable juices and water. 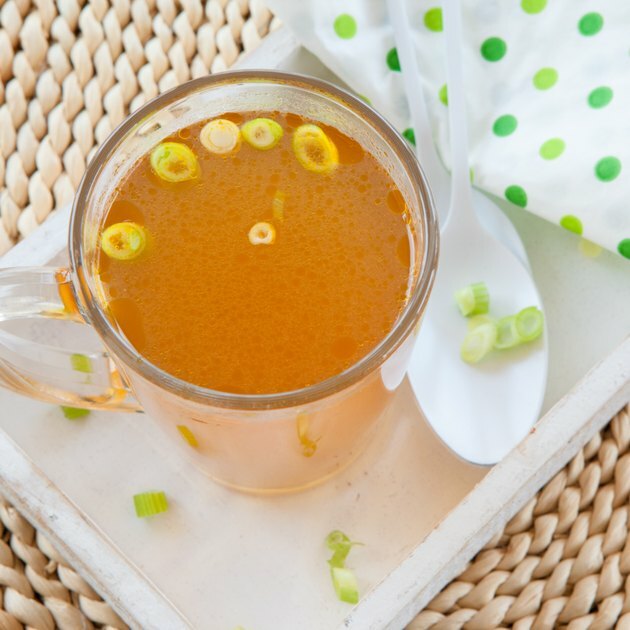 Clear, liquid-based broths are also acceptable. Cleanse proponents claim juices are an easier transition to food as they are easier to digest in the stomach versus solid foods. Liquids supposedly create less work for the organs, including the stomach, liver and kidneys. Juices made from fruits and vegetables will be higher in nutrients and a source of carbohydrates, which provides energy for normal body functions and daily activities. The third day after the cleanse, dieters may start eating more foods. This should not include processed, refined foods that come in packages, cans or have added sugars, fats and additives. This includes white breads, white flours, cookies, canned soups, chocolate bars and candy. Meat and dairy products are not recommended as they tend to be harder to digest, higher in calories and a source of added hormones. Instead, dieters are encouraged to eat plant-based foods, particularly vegetables with fruits and whole grains, in moderation. A plant-based diet is recommended for long-term success if it balances complex carbs, lean proteins and healthy fats.